Please don't take my sunshine away. 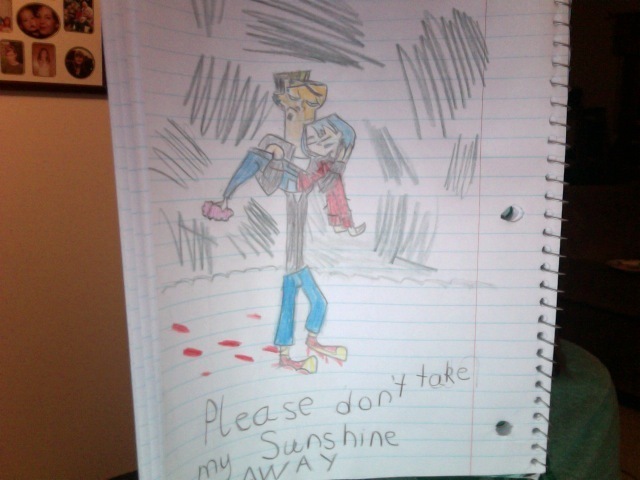 This is based off of a picture I saw of Duncan and Courtney, who got shot. Gwen just got shot, and (if anda had read my fanfiction it would make lebih sence) Duncan is bernyanyi "Please Don't Take my Sunshine Away". Wallpaper and background images in the TDI's GwenxDuncan club tagged: duncan gwen love sunshine sad. This TDI's GwenxDuncan fan art might contain tanda, poster, teks, and papan tulis.